During concrete slab edge spall repairs on post tensioned (PT) buildings, the typical procedure is to replace rusted PT anchors along the slab edge. The problem is that the PT anchors are holding very high PT cable loads. The loads help support the interior areas of the building. Replacing a PT anchor that is holding load requires additional concrete excavation about five feet away to find and expose the cable and install a temporary lock off. Then the PT cable is cut and removed with the anchor. A new section of cable is spliced in with a new anchor and tensioned. The decision to include replacement of these rusted anchors creates a very high project cost. During a recent project, we were asked to review these repair procedures during balcony slab edge spall repairs. A separate engineer and contractor had been previously hired for the concrete edge spall repairs. The engineer reported that in addition to the slab edge spalls, exposed PT anchors at the slab edge were significantly deteriorated, causing a structural integrity issue. During the repairs, seven PT anchors were replaced. The PT anchor replacements were very costly and required interior slab excavations to install temporary load lock offs. The purpose of our review was to provide a second opinion regarding the need for PT repairs. We observed the work during the repairs and took the removed PT anchors away with us to investigate in our workshop. The spall repairs excavations exposed rust on edge rebar and the exterior side of PT anchors. The edge rebar was not thinned significantly. The PT anchors were all replaced. Some of the rebar behind the PT anchors showed very little rust. The repair process required interior lock offs. New concrete was placed, and the new PT anchors were tensioned. The anchor, wedge, and cable were saw cut in half. The exterior no-load side of the cable is significantly deteriorated. The exterior no-load side of the anchor has minor pitting approximately 0.005-inches deep. The interior load side of the anchor shows minor pitting approximately 0.005-inches deep. The inside conical surface of the anchor has minor pitting < 0.005-inches deep. The outside surface of the wedge has minor pitting < 0.005-inches deep. The inside surface of the wedge shows clean serrated teeth intact along the cut. The serrated teeth that did not contact the strands are covered in scale the same height as the teeth. The cable strands on the load side of the anchor show clean bite marks from the wedge teeth with no rust and no loss of cross-sectional area. The wedges and cable were machine pressed out of the anchor. The wedges stayed attached to the cable strands. The no-load side of the cable has no loss of cross-sectional area. The no-load side of the anchor has some minor pitting approximately 0.005-inches deep. The load side of the anchor has some very minor pitting approximately 0.005-inches deep. The inside conical surface of the anchor has very minor pitting < 0.005-inches deep. The outside surface of the wedges has very minor pitting < 0.005-inches deep. The loaded side of the cable is lightly oxidized with no loss of cross-sectional area. The anchor, wedge, and cable were left intact. The no-load side of the cable is significantly deteriorated. The no-load side of the anchor has rust scale mostly at the outermost surface at the collar. The load side of the anchor has some surface rust and outer edges pitted areas approximately 0.06-inches deep. The load side of the cable has no loss of cross-sectional area. The no-load side of the cable has no loss of cross-sectional area. The no-load side of the anchor has minor pitting and scaling mostly at the outer edges with pitting approximately 0.005-inches deep. The load side of the anchor has some surface rust at the edges with only pitted areas of 0.06-inches in some areas. The load side of the cable has no loss of cross-sectional area. The no-load side of the cable is deteriorated with approximately 30 percent loss of cross-sectional area. The no-load side of the anchor has minor pitting and scaling. The pitting is approximately 0.005-inches deep. The load side of the anchor has some surface rust at the edges only. The load side of the cable has no signs of rust or deterioration. The no-load side of the cable has no loss of cross-sectional area. The no-load side of the anchor has minor pitting approximately 0.005-inches deep. The load side of the anchor has some surface rust with minor pitting around the edges only approximately 0.005-inches deep. The load side of the cable has no signs of rust or deterioration. The anchor, wedge, and cable were installed into a bench vice intact. The cable was cut square with a cut off wheel close to the anchor. The cable on the load side of the anchor was pounded with a five pound hammer in an effort to unseat the wedges. The cable and wedges could not be knocked out. The concrete edge spalls were mostly caused by rebar rust and could have been helped by rust on the exterior no-load side of the PT anchors. There were no spalls on the load side of the PT anchors. The PT anchors were not causing a structural integrity issue because they were all holding the full PT load. Steel surfaces loaded in high compression against other steel surfaces will not rust. The steel loaded in compression in the wedges serrated teeth showed no rust. The rust on the PT parts only propagated between void spaces between cable strands or wedge spaces. If the void spaces were reduced or eliminated, the rust would be eliminated. Concrete loaded in compression has increased tensile capacity and is less likely to spall. There should be no structural integrity concern for the possibility of future PT failures. Future PT failures will only occur one at a time and can be safely repaired one at a time. If any PT cable has lost its load, it needs to be replaced and tensioned. If a PT anchor had a cable that was significantly thinned due to rust, the PT cable would fail, and the anchor would have loose strands in it. It is hard to hide a failed PT cable. We have never seen spalling concrete on the load side of a PT anchor without movement of the PT anchor. Movement of the PT anchor would be considered failure. 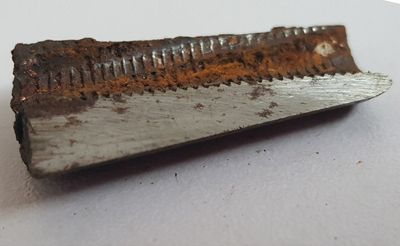 There are no industry standards or available guidance for rust on PT anchors in combination with rebar corrosion-caused spall repairs. Concrete repairs with PT structures do not follow any concrete repair standards. The current standard for rebar only corrosion-caused spall repairs is excavation of concrete behind rebar and along the rebar until the rust cleans up. The common practice is doing spall repairs after spalls occur. This means that before a spall occurs, rebar rust may be occurring, but there is no structural integrity concern. Repairs are not needed until after spalls occur. When concrete is pre-loaded in compression, the effect is an increase in tensile resistance. Concrete on the load side of a PT anchor is in compression. Concrete is less likely to spall in a compression zone. If a PT anchor showed rust on the exterior no-load side after concrete excavation on the exterior side, the exterior side of the PT anchor could be cleaned of rust. If the PT anchor is holding its load, it does not need to be replaced. Rust on PT anchors or cables does not cause a loss of the ability to carry load unless there is a failure. A PT anchor or cable will hold the full design load until it fails. It will not release its load slowly. If a PT anchor or cable fails, then PT repairs are needed. This means that before a PT failure occurs, there is no structural integrity concern. PT repairs are not needed until PT failures occur. Engineers generally decide on the extent of repairs needed based on their judgment of structural integrity. Since there are no standards for PT repairs, each engineer can decide differently and not be wrong. Most engineers proceed to replace rusted PT anchors because it might be a problem in the future. They include it in the current repairs, but this is very costly. The other logic is that if the rusted PT anchor is holding load, it is not a problem now. The rust can be cleaned, and it may hold load for a long time into the future. Replacing PT anchors earlier than needed is a judgment call that saves money. PT anchors should only be replaced as soon as possible after failure. During slab edge concrete spall repairs, rusted PT anchors still holding load can be left intact. The slab edge concrete repairs can proceed around the PT anchor. Rust can be cleaned on the outside no-load side of PT anchors. Corrosion inhibiters can be added before placement of new concrete. 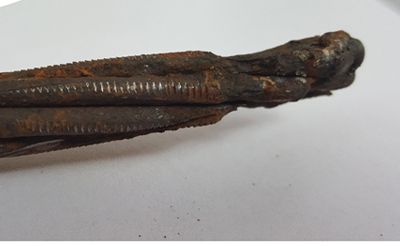 Small hairpin rebar can be doweled in or added around PT anchors to reinforce edge repairs. PT anchor and/or PT cable failures should always be repaired right away, not saved up till your next concrete repair project. Donald K. Chalaire, PE, SI, is a Professional Engineer and Special Inspector with 34 years of structural design experience, with a strong background in structural analysis, structural design, testing, structural restoration, repair construction practices, structural inspections, and expert witness work. 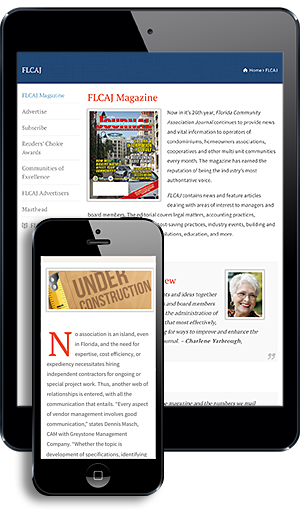 He received a BS in mechanical engineering from the Florida Atlantic University and an MS in civil engineering from the University of South Florida. He is a member of PTI, ACI, ICRI, ASCE, and FSEA.